In Kansas Community Improvement Districts, merchants charge additional sales tax for the benefit of the property owners, instead of the general public. Community Improvement Districts are a relatively recent creation of the Kansas Legislature. In a CID, merchants charge additional sales tax, up to an extra two cents per dollar. Community improvement district using bonds. Click for larger version. There are two forms of CID. Both start with the drawing of the boundaries of a geographical district. 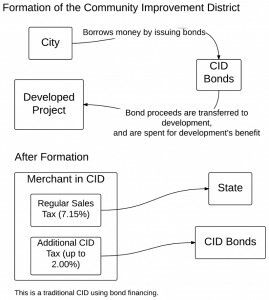 In the original form, a city borrows money by selling bonds. Then, the bond proceeds are given to the owners of the district. The bonds are repaid by the extra sales tax collected, known as the CID tax. The repayment period could be up to 22 years. In the second form of CID, the extra sales tax is simply given to the owners of property in district as it is collected, after deduction of a small amount to reimburse government for its expenses. This is known as a “pay-as-you-go” CID. The “pay-as-you-go” CID holds less risk for cities, as the extra sales tax — the CID tax — is remitted to the property owner as it is collected. If sales run below projections, or of the project never materializes, the property owners receive less funds, or no funds. 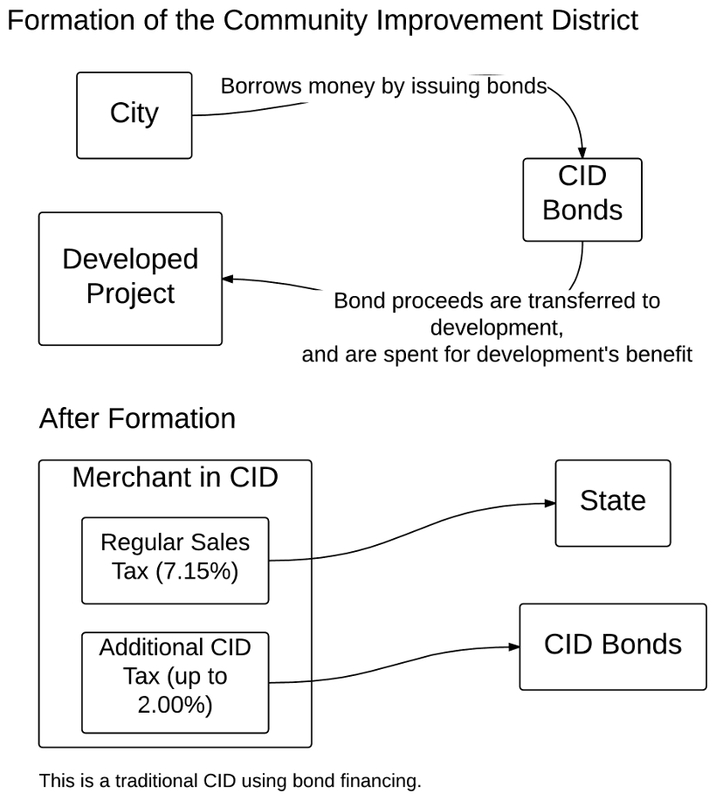 With CID bonds, the city must pay back the bonds even if the CID tax does not raise enough funds to make the bond payments. Community improvement district using pay-as-you-go. Click for larger version. Of note is that CID proceeds benefit the owners of the property, not the merchants. Kansas law requires that 55 percent of the property owners in the proposed CID agree to its formation. 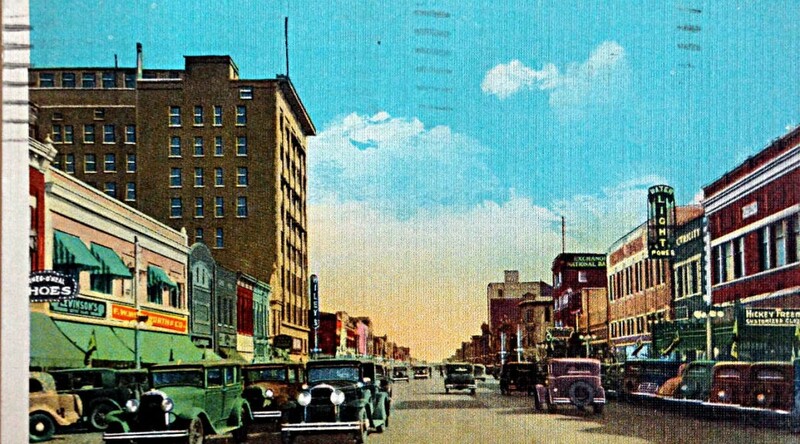 The City of Wichita uses a more restrictive policy, requiring all owners to consent. 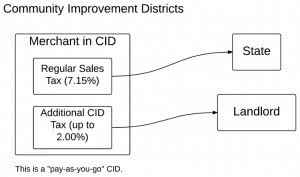 Perhaps the most important public policy issue regarding CIDs is this: If merchants feel they need to collect additional revenue from their customers, why don’t they simply raise their prices? But the premise of this question is not accurate, as it is not the merchants who receive CID funds. The more accurate question is why don’t landlords raise their rents? That puts them at a competitive disadvantage with property owners that are not within CIDs. Better for us, they rationalize, that unwitting customers pay higher sales taxes for our benefit. Customers of merchants in CIDS ought to know in advance that an extra CID tax is charged. Some have recommended warning signage that protects customers from unknowingly shopping in stores, restaurants, and hotels that will be adding extra sales tax to purchases. Developers who want to benefit from CID money say that merchants object to signage, fearing it will drive away customers. State law is silent on this. The City of Wichita requires a sign indicating that CID financing made the project possible, with no hint that customers will pay additional tax. The city also maintains a website showing CIDs. This form of notification is so weak as to be meaningless. One of the follies in government economic development policy is the categorization of costs into eligible and non-eligible costs. The proceeds from programs like CIDs and tax increment financing may be used only for costs in the “eligible” category. I suggest that we stop arbitrarily distinguishing between “eligible costs” and other costs. When city bureaucrats and politicians use a term like “eligible costs” it makes this process seem benign. It makes it seem as though we’re not really supplying corporate welfare and subsidy. As long as the developer has to spend money on what we call “eligible costs,” the fact that the city subsidy is restricted to these costs has no economic meaning. Suppose I gave you $10 with the stipulation that you could spend it only on next Monday. Would you deny that I had enriched you by $10? Of course not. As long as you were planning to spend $10 next Monday, or could shift your spending from some other day to Monday, this restriction has no economic meaning. If a merchant moves into an existing CID, how might they know beforehand that they will have to charge the extra sales tax? It’s a simple matter to learn the property taxes a piece of property must pay. But if a retail store moves into a vacant storefront in a CID, how would this store know that it will have to charge the extra CID sales tax? This is an important matter, as the extra tax could place the store at a competitive disadvantage, and the prospective retailer needs to know of the district’s existence and its terms. Then, if a business tires of being in a CID — perhaps because it realizes it has put itself at a competitive disadvantage — how can the district be dissolved? 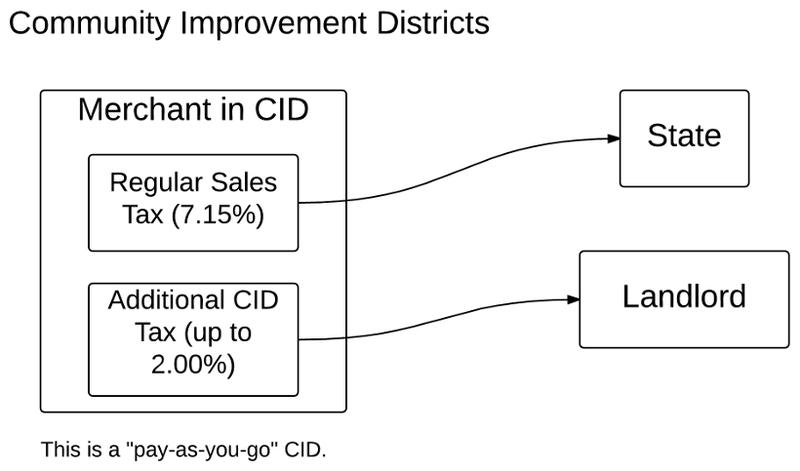 CIDs allow property owners to establish their own private taxing district for their exclusive benefit. This goes against the grain of the way taxes are usually thought of. Generally, we use taxation as a way to pay for services that everyone benefits from, and from which we can’t exclude people. An example would be police protection. Everyone benefits from being safe, and we can’t exclude people from participating in — benefiting from — police protection. But CIDs allow taxes to be collected for the benefit of one specific entity. This goes against the principle of broad-based taxation to pay for an array of services for everyone. But in this case, the people who benefit from the CID are quite easy to identify: the property owners in the district.